Would you recommend Daybreak to a friend? @derek_t_lo Love the design. With machine learning becoming more pervasive in day to day apps, I think we will be seeing a lot more apps like this that will focus on preemptive measures. @andym_dc Hey Andrew, as a student myself I definitely understand. Email me at derek.lo@yale.edu and I'll give you a promo code. Any other students with a valid .edu email account, feel free to reach out for a free code also! You're saying that the app learns then gives you the suggestion, rather than you just setting it? Either sounds like an annoyance or an unnecessary feature. @tnargus Hi Blair, not exactly. When you go to create a new reminder, a standard iOS Datepicker appears, so that you can set the time manually if you want. The time recommendation feature allows the Daybreak to scroll the wheel automatically to a time it think you'll pick. 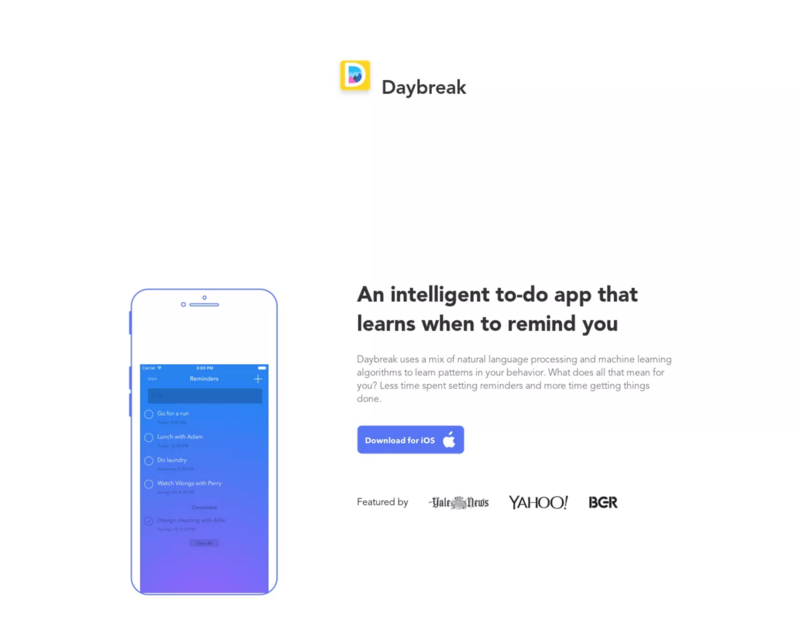 If you happen to be a person that sets reminder sporadically with no pattern, you can simply turn off this feature and Daybreak functions just as well. Any more questions? @derek_t_lo there seems to something off with the (very first) asset added to this Hunt. The screen frame is off compared to the mock iPhone. Look at this picture: Looks like it's fixed on the website, so you might need to re-sync the assets on this Hunt to update them. Also, any plans for an Android release? @anthonymonori Thanks for noticing this and posting about it, Anthony. We do have plans for an Android release but I can't give a definitive timeline just yet. Stayed tuned. Just bought it! Can't wait to try it out. @b_wleung Thanks Beatrice! Excited to hear what you think. This looks pretty awesome. I use a paper bulletjournal system with a few overlap in phone reminders to stay on top of habitual tasks. Any plans for Apple Watch integration? @amy_r In the spirit of full transparency, I would say that this is not our #1 priority as of now. Getting an Android version out the door is at the top of our list of to-do's. Simple and colorful calendar app.